We are officially building up now which is exciting for us! 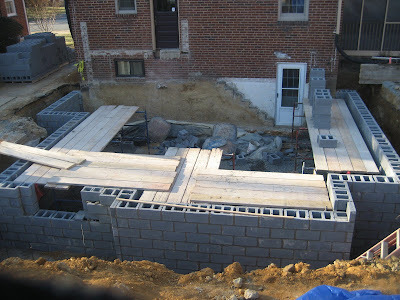 As you can see from the pictures, they made a lot of progress in just one day. I would estimate that they are a little more than half done with laying the block but Jim Cole says that the top is very important because that's how you ensure that new and old floors are perfectly aligned and level. I assume that will take some time and careful planning. In any case, it's great to see the progress moving along so quickly. See the pictures in the construction photos on the left. Once the block is laid, everything will be sealed on the outside and then it will be time for the steel beam to be installed. Our steel has been ordered so it should be ready when our structure is ready for it.